In the same, Trump administration and the wine industry piece that I remarked upon in yesterday's post, under the sub-heading 'What's normal farming?' the author of the column writes about "what seems to be a case of government over-reach." John Duarte, owner of Duarte Nursery in Modesto (a grapevine nursery that I have purchased grapevines from in the past), is in deep manure with the Environmental Protection Agency (EPA). The EPA is seeking $2.8 million in fines from Duarte that the agency says were incurred when Duarte tilled 450 acres of wetlands near Red Bluff, CA, in preparation for planting wheat. The saga is a convoluted tale of what Duarte actually did and what the Army Corps of Engineers said he did. In addition to the $2.8 million in fines, the EPA wants Mr. Duarte to purchase up to 132 acres of "wetland mitigation credits" which would set Duarte back some tens of millions of dollars. So, let me get this right, it seems that if one pays exorbitant fines to the government and purchases 'carbon credits' to mitigate a perceived indiscretion against Mother Nature, then one can do whatever one wants with, in this case, the wetlands. Sigh. Common sense may yet prevail, as two House members, Michael Conaway and Bob Goodlatte, are arguing that Duarte's field work should qualify as "normal" farming practices under a Clean Water Act (1972) exemption. It is curious to me that in the same article, Kathryn Hall, of Hall Wines and a former U.S. ambassador, waxes lyrical about her goal of certifying all of her vineyards as "green" by 2020, despite, that is, these "green-decisions" not making "financial sense in the short term." That's so altruistic and earth-friendly of her. Mrs. Hall and her husband, Craig, are developing a new 209 acre vineyard, Walt Ranch, on a 2,300 acre parcel they own in the eastern hills of Napa County. The Napa County Board of Supervisors approved the new vineyard last December, but opponents (the neighbours of the vineyard, first proposed 10 years ago) are fighting it all the way. It is not a densely populated area, but the people that live there not happy with, amongst other things, the fact that 14,000 trees (down from an original 28,000) will have to be removed to make way for the vineyard. Green, indeed. Everyone in the United States needs to eat, but they don't necessarily need to drink wine. I suspect the Halls have friends in high places: friends much more rarefied than any of Mr. Duarte's farmer-buddies. Despite having an extremely wet winter, the golden hills that California is famous for have arrived for the season, albeit a little later in the year than is the norm. Them thar golden hills are indeed one of the reasons why California is nicknamed The Golden State. At breakfast this morning, I was reading a piece in last week's 'On Wine' section of The Napa Valley Register about climate change. The headline of the article read: Trump administration and the wine industry. Under the guise of a business related feature, the column contained a comment from some Harvard professor or other who said, "that the land suitable for grapegrowing could shrink 23 to 75 percent by 2050." I am assuming the good professor, who was a panelist at the recent Vinexpo in Bordeaux, is referring to existing grape-growing regions and the fact that they could, in the next thirty-odd years, be rendered un-replantable due to global warming. On the other hand, if the Ivy League scholar is alluding to the planting of new vineyards I'd posit that the Napa Valley has already reached its saturation point, or is very close to it, so it's a moot point. There isn't much available land left; there is no new valley floor being created and there is an on-again, off-again moratorium on hillside vineyards. No land, no planting, no problem. Besides, not every available postage stamp-sized piece of land should have grapes planted on it. Napa needs more housing, open spaces, expanded infrastructure and services for its existing residents. And, of course, dog parks. And, speaking of dog parks, here is Vinodog 2 surveying her gilded, off-lead doggy-domain which, incidentally, is surrounded by vineyards that until about 14 or 15 years ago used to be cattle grazing land. Progress due to a shift to a preferable, and more profitable, industry? Or a land-use change due to "emissions of heat-trapping gases from fossil-fuel burning...?" Vinodog 2's dog park, and the vineyards surrounding it, may well revert to a more pastoral use of the land, oh, in about 30 years from now. Yesterday, I noticed this little fig on one of three fig trees that I have growing in pots. Today, on further inspection, I noticed two more smaller figs on the same plant. I'm so excited, yay! Years ago, Vinomaker was given a Mission fig (Ficus carica) as a gift; it was planted out in a low spot in Vinoland, down by the creek, where it was promptly killed by the first frost of the winter. The next spring, I noticed three small plants growing under a large oak tree by the house with leaves that looked suspiciously fig-like. As I do with 99% of all growing things I find that pique my interest I potted them up and put them in the nursery, alongside an assortment of potted grapevines (my emergency reserves). And there they have remained for the past four or more years, protected from severe, low temperatures by their proximity to Vinoland's barn. I have made a promise to the fig trees that from now on I will take better care of them. Everything seems to be thriving in Vinoland. I picked my first ripe tomato today and it looks like I should have enough for a salad by next weekend. The figs are going to take a bit longer. The Marketing Queen at TWWIAGE recently gave me a copy of a Japanese magazine to read in which TWWIAGE was featured. I say read, but there was not one, single word of English in the current issue of What-Wine!? (their punctuation, not mine) magazine. So I just looked at the pictures. And very nice pictures they were: it is a beautifully produced publication. 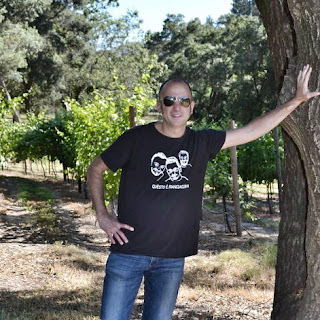 However, something other than photographs of TWWIAGE's vineyards and winemaker caught my eye. 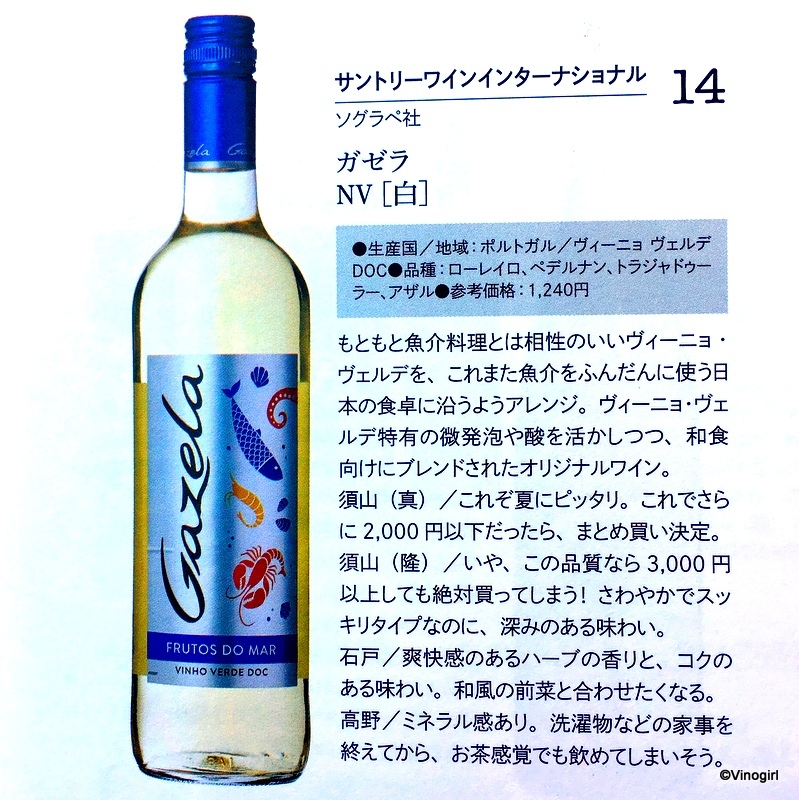 The first time that I tasted Gazela's Vinho Verde, I remember thinking that it was pleasant, but that I had had better. Well, I have since had to eat my words (or rather, drink them). I drink Gazela all the time and I can still buy it at my local supermarket for $3.99 (if I buy six bottles at a time, which I do). The photograph that intrigued me in Wine-What!? was that of a Gazela wine called 'Frutos Do Mar' (seafood). Although I did notice the initialism 'DOC' in the write-up of this wine, I gleaned no information from the magazine's text. So off, onto the internet I went. 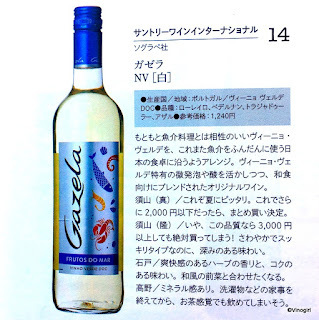 Apparently, last year Sogrape, the producer of Gazela and Portugal's largest family owned winery, decided to repackage their Vinho Verde specifically for the Japanese market. It seems that 'Frutos Do Mar' is the same wine, but packaged to let the Japanese consumer know that the wine is seafood friendly. Can we say, sushi? Yes, we can. I had noticed that Gazela had changed the label this year/batch (remember, it is a non-vintage wine) from the old clear label to a new silver label. I'm just wondering if the seafood-friendly-marketing-move will make it to the USA in the future: does America need idiot-friendly labelling? Actually, I don't care - I'm going to continue to drink Gazela no matter what the packaging looks like. Labels: Frutos do Mar, Gazela, Happy b-day Julie, Japan, Marketing Queen, Portugal, TWWIAGE, Vinho verde, Wine-What!? Vinomaker and I had the pleasure of hosting Dr. Jeremy Parzen Ph.D. in Vinoland the past two days. It wasn't really a social visit, although we did have a lot of fun and good conversation on Friday night. No, Jezza was in California to work on a very exciting, new project for him, so he was just passing through. And he departed Vinoland just in time. It go to 104° F today: it was stinking hot. Of course Vinomaker had picked today to be a bottling day. The St. Helena Sots, thankfully, showed up in Vinoland early and the bottling event went smoothly, quickly and without incident. It was so hot that there was, unfortunately, no afterglow-luncheon - it was just too uncomfortable to be outside. Don't know about anyone else, but I for one didn't want to be the BBQed meat! Green, green grapes of home. The weather has turned hot, finally! We have had three days of mid 90s temps. I'm loving it, but the grapes probably aren't as enthusiastic about it as I am. So, to make the little grapettes feel better, they have been treated to their first watering of the season. Watering the vines is not as easy as just turning on a tap, of course, nothing is that straight forward. The vineyard drip irrigation lines have to be flushed of any deposits that may have collected in the lines over the previous growing season - deposits that could clog the emitters. In Vinoland, the main culprit is the iron bacteria that is in our well water. The intense orange colouration of the water that blasts out of the end of the lines, (always my end of the line, Vinomaker is always upstream), is fantastic. Stay hydrated, little grapies! It's hard to take a good photograph of a moving target, or targets. What I initially thought was an army of cavorting frogs, turned out to be covey of, at least, ten baby quail bopping about under the watchful eye of their ever alert dad. (Two to Mr. Quail's right side, one behind his tail and seven bringing up the rear.) I got as close as I could, but dad was getting more and more agitated by my presence. Mum was no where to be seen. This might have been the little 'uns first time out of the nest: they are tiny. Mr. & Mrs. Quail have been hanging around Vinoland for weeks now, but I couldn't quite work out where they had decided to make their nest. I know now, so no work in the Syrah block for a while. It rained today; heavy at times, but mostly a miserable, stubborn drizzle that lasted all-the-grey-day-long. And the temperature climbed to a whopping 65° F. Hmmph! Not exactly optimum conditions for bloom in the grapevines - which seems to be going quite slowly this year. Come back, California-sunshine. The number of days that the grapevines are in bloom is dependent upon the weather. When conditions are favourable bloom can take about 8-10 days, (but it can take as long as two weeks under cool conditions like the Napa Valley is experiencing now). And, of course, the flower clusters on a grapevine will not all bloom at exactly the same time, so that spreads bloom out a bit. Still, I think bloom is more protracted this year. I have also noticed that there are more clusters per shoot and that the clusters seem to be a bit bigger than the past two years. Do not be alarmed by this picture of detached grape flowers from one cluster of Cabernet Sauvignon at TWWIAGE (and hand-modeled by a coworker). Although it looks like a lot of dead material; anthers, calyptra, stamens, etc., it is quite normal. As few as 20 to 30 percent of the flowers on a cluster will develop into berries, most will fall from the cluster during the initial stages of berry growth. Furthermore, a significant number of flowers will drop from the cluster about 8 to 12 days after full bloom: a stage commonly known as shatter. Fruit set is not complete until after shatter. Phew! It's a jungle out there. Fruit, set, now!